Don't you just LOVE wednesday's? Say hello to wednesday "hello wednesday" It's all down hill from now on to the weekend - yippee!!! I had so many enquiries and questions about my ribbon wands at Exeter that I thought I had better show you them in greater detail. Gather the bits you need around you. 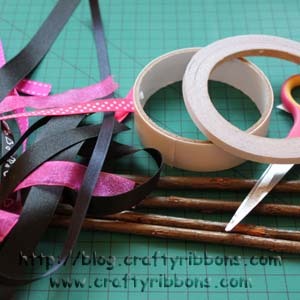 Double sided tape a wide and a narrow, scissors, a twig and a selection of ribbons. 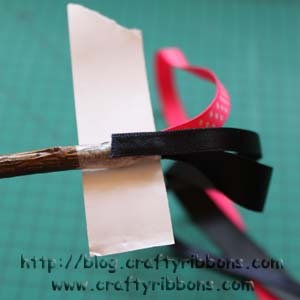 Using the wide double sided tape, stick around the top of your twig. Finished top section of the wand. 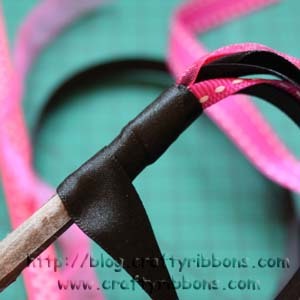 With the narrow double side tape put a strip along the length of the twig. 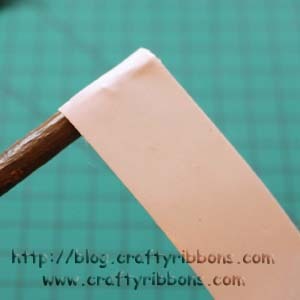 Just peel off a small amount of backing paper, start at the top with 15mm satin ribbon (the length will depend on the length of your twig). 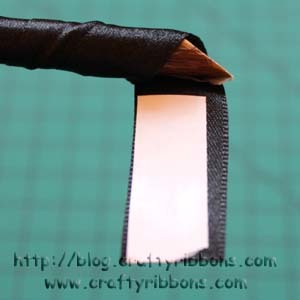 Wrap the ribbon all the way round the top to cover the double sided tape. 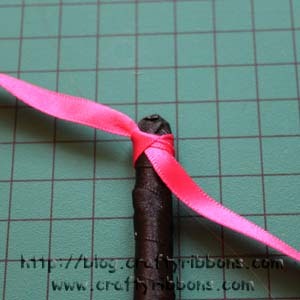 Continue wrapping the ribbon around the twig so that it slightly overlaps. Remove the double sided tape backing paper a bit at a time. 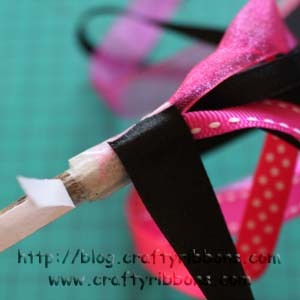 When you get to the bottom, cut a piece of double sided tape and stick to the ribbon. 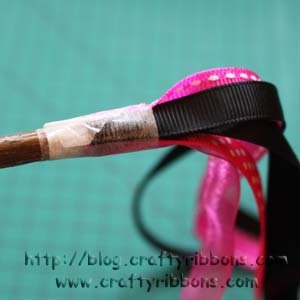 Finish the wrapping of ribbon and squish the excess ribbon in place, You can form a neat end by using a lighter and melting the ribbon and moulding it to fit the twig. 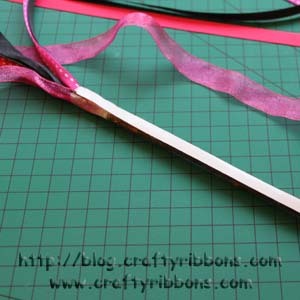 DO NOT use your fingers to mould the ribbon as it will be hot, use a cutting mat or hard surface. Fold the wrapping ribbon in half to find the centre and tie onto the bottom of the wand (my twig was 23cm long and I used a ribbon 1.8mtr long to wrap). Place a knot on top to secure. 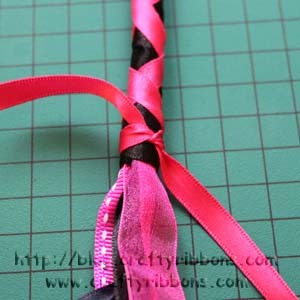 Take both ribbons to the back of the wand and cross over and then bring them to the front of the wand and cross over. Keep wrapping the ribbons around the wand. 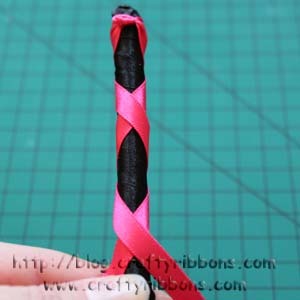 When you get to the top of the wand, knot the ribbon making sure it is tight. 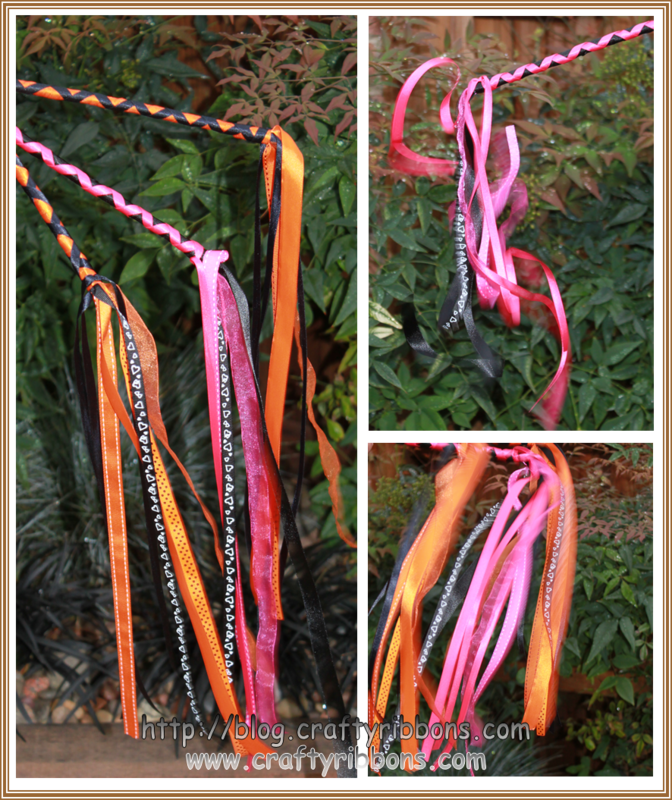 Leave two long ends that will make two extra streamers. 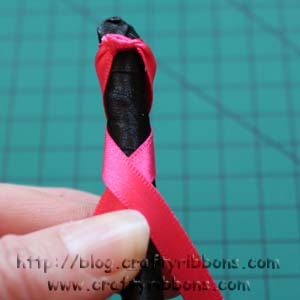 Seal the ribbons ends by using either clear nail varnish or running them under a naked flame. I must say that I only made these as a little bit of fun for the little ones. I had no idea how popular they would be. Several of my customers at Exeter wanted to buy Mollies wand that was on display for grandchildren. 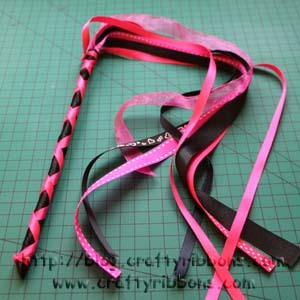 I tried to explain how to make them, in the end I said I would make them and post the wands - Ali the wand maker!!! All our halloween Ribbons and Buttons are on our website, you can find them all HERE.